High School Freshman Kicks 55 Yard Field Goals! I had the opportunity to work with Christopher Gulla from Toms River North High School again this summer while I was in New Jersey for our annual jersey shore kicking camp. It was awesome news to get and was very rewarding for me to know that the few kicking lessons we did and him attending the camp last year helped him so much. Christopher has improved even more since last year and this week during our 1 on 1 kicking lessons he was booting 50+ yard field goals with ease and even hit some 55 yarders. We tried a couple at 60 yards but it was just a little out of range. 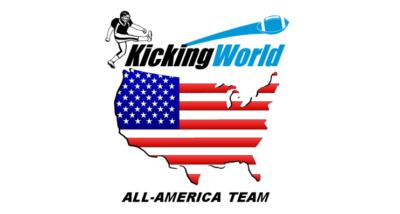 Be sure to watch the Christopher Gulla Highlight Video with kicks from his private training sessions with Coach Brent and highlights from the 2010 New Jersey Kicking Camp. Chris is going to be a force to be reckoned with this 2010 season as he starts his sophomore campaign. Be sure to keep an eye out for him in the newspapers and blogs online!